This October, we’re celebrating IABC/BC members. 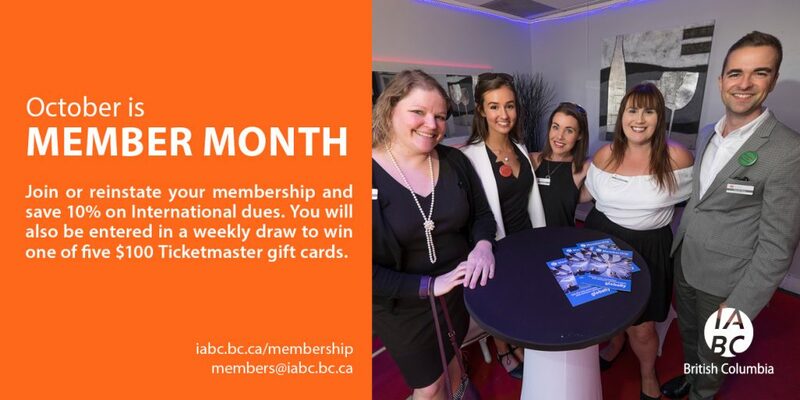 Whether you’ve been a part of IABC/BC for years, are new to communications, or looking to re-join after some time away from our chapter, Member Month is the perfect time to join IABC/BC and become a part of the chapter. IABC International’s theme for this Member Month is Rocktober, which makes sense because being an IABC member rocks! Everyone loves savings and IABC makes it easy to save a little bit of money on your membership this month. New and renewing members will save 10% on International dues during the month of October. Plus, you’ll be entered in a weekly draw to win one of five $100 Ticketmaster gift cards. • Get one entry per referral into a draw to win one of 10 Amazon Echo devices—there’s two winners drawn each week! Becoming a part of IABC/BC opens up a whole new world of learning, connecting, and volunteering. Our members come from all kinds of backgrounds, work in dozens of industries, and have a range of experiences on their resumes. • Volunteer opportunities to develop your skills within a supportive environment while helping the chapter and the communications profession. If you’re ready to join IABC/BC, visit the Join page on IABC.com. All you have to do is choose your membership type, select the chapter you want to join (British Columbia! ), and pay your dues for the year. Corporate memberships must be purchased through headquarters. This type of membership is great for communications teams that want to buy memberships for multiple people. To start the process, contact IABC International at member_relations@iabc.com. Renewing is fast, easy, and worthwhile to continue to enjoy the benefits of an IABC membership. To renew, login to your member profile and follow the steps on the home page. You may also receive an email from IABC prompting you to renew your membership. In that case, just follow the steps outlined in the message. Where Can I Learn More About IABC Membership? If you have questions about an IABC/BC chapter membership, contact Spencer Perry. Spencer is our director of member services for the 2017-18 board year. He can be reached at members@iabc.bc.ca. If you have general questions about IABC or run into troubles during registration, contact IABC International at member_relations@iabc.com. You can also call IABC headquarters at 1-800-776-4222.